#1: Unless you cooked the meal you cannot complain about what is in it or how it tastes. #2: Dessert cannot be served until all dishes are done, and put away. It's funny, really. As many of you know we recently moved from our tiny condo into our new (to us) house and we have quite the gorgeous new stainless steel dishwasher. It came with the house. We've been here 5 months and I have yet to use it. What can I say? The thought of dishes sitting, even rinsed, partially dirty in a metal box in my kitchen just doesn't feel right. So long as I've lived on my own (or attached without kids) I've always just done my dishes after each meal. It's habit, really. But, when you do all those dishes by hand you get a little....particular about the way you want them done. Momma actually raised me to be loyal to one brand when it came to my dishes and the kitchen sink. Scotch-Brite™ has been a trusted name in our family for generations (I have the photos from pot lucks and baking marathons to prove it). There wasn't a night that passed where our bright green or blue Scotch-Brite™ sponge didn't get put to good use scrubbing up the night's culinary experiment messes. But I, I am #TeamDishCloth. What is Team Dish Cloth? Well it's the kitchen debate almost as heated at the bathroom's 'over or under' toilet paper argument. 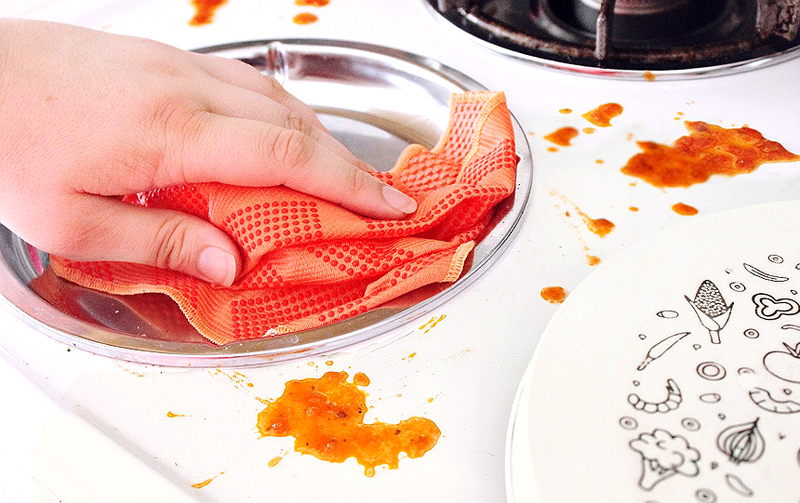 There's no right or wrong answer, of course, it's all personal preference- and, in my house the Scotch-Brite® Scrubbing Dish Cloth is the hero of our kitchen. 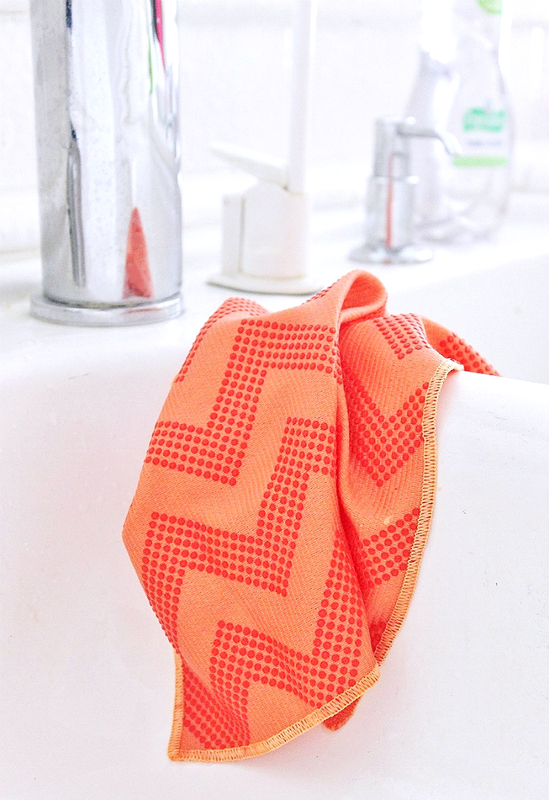 In fact, I'd say it's the hero of the house- there's no cleaning task our scrubbing dish cloths won't conquer since they're machine washable and feature both a gentle cloth side and a tough textured scrubbing side. 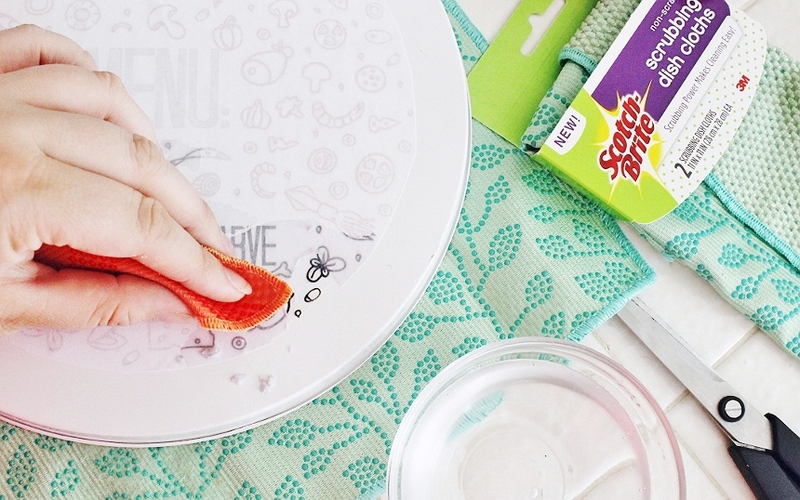 I use my scrubbing dish clothes in crafts, annual cleaning sprees, and, of course for tough kitchen messes. 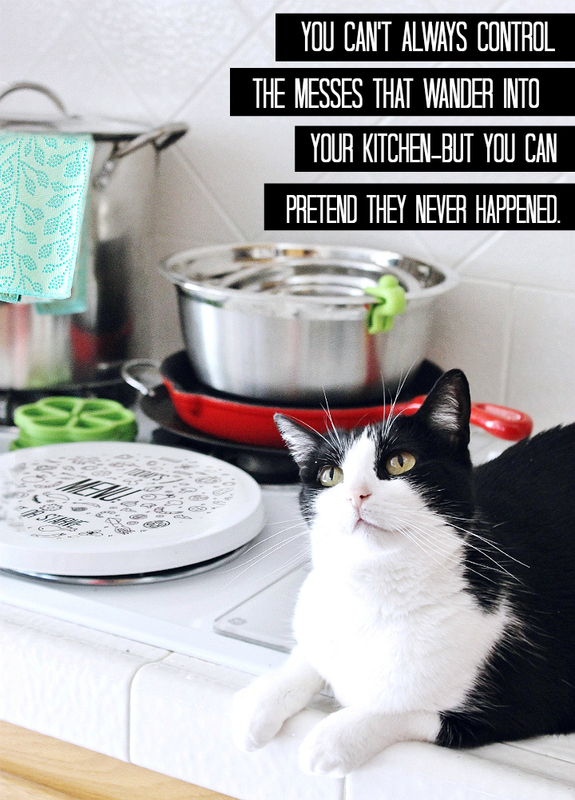 Naturally I want our kitchen to have as much personality as the rest of our house. We're still 'settling in' on the whole 'turning a house into a home' front, but small additions here and there really help make things more personal and cozy. 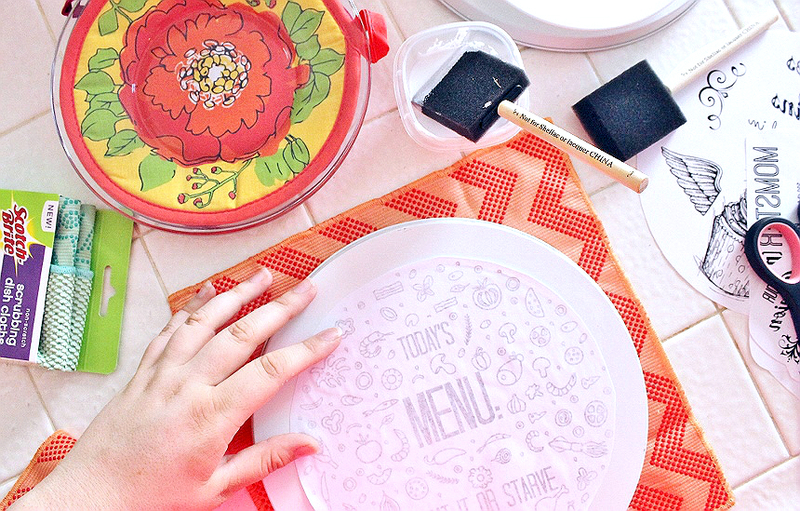 You guessed it- I crave pops of color in my kitchen, too. And the Scotch-Brite® Scrubbing Dish Cloths come in beautifully rich colors such as Navy, Coral, and Mint, when you shop them at Target. You'll find them in the cleaning supplies aisle next to an assortment of other modern design friendly kitchen and home cleaning aid innovations from Scotch-Brite®. As we move into Spring I've been really inspired by the Coral color and love how it matches the fresh Spring blooms we pull in from the garden! 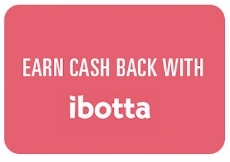 Speaking of inspiration- Check out the buttons above to take advantage of some awesome Scotch-Brite® promotions, including the Scrubstakes with a $20,000 kitchen remodel prize up for grabs, and some exclusive savings from Coupons.com and Ibotta! 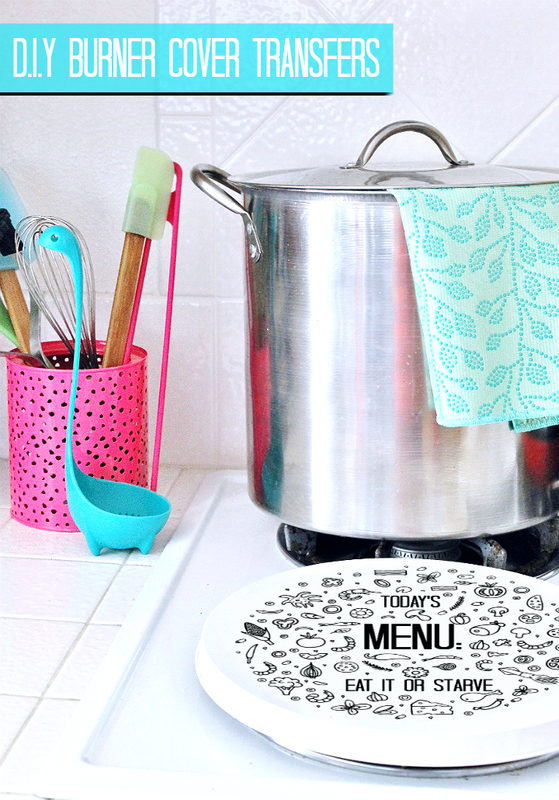 In fact my scrubbing dish clothes even inspired me to dress up my kitchen and stove a little. 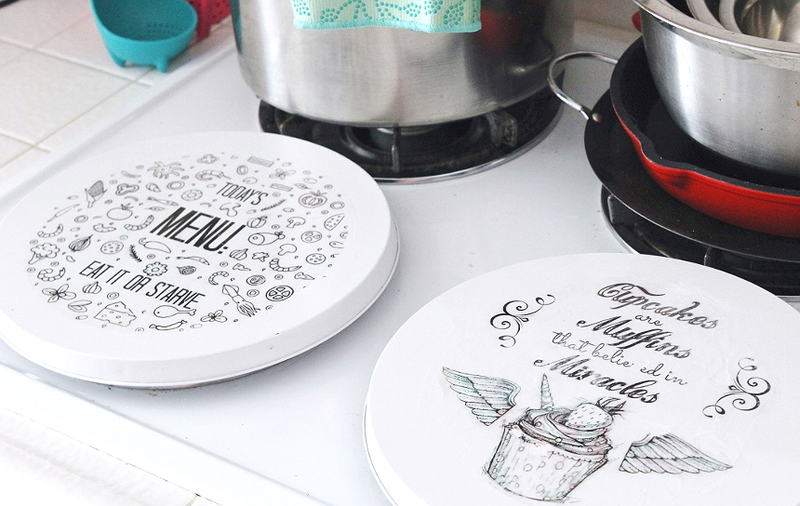 While on my most recent shopping trip to Target I happened to pick up a new set of white burner covers and some classic white coffee plates. I've been wanting to play with image transfers to hard surfaces for a while and, with Mother's Day coming up, this seemed like the perfect time. After all, my photo albums were still at easy access from the move. I researched this technique a lot, like a lot a lot, before attempting it- I didn't find much information. The concept of transferring an image to a shiny/sealed surface without a bunch of chemicals or special transfer paper is overwhelming but the Freezer Paper technique will work. Yes you really can cut freezer paper to the same size as printer paper (8.5" x 11") and run it through your printer and print with no problem. I suggest using a sharp edge (box cutter) to make sure you have precisely cut 'pages' and have found that an ink jet printer works best. 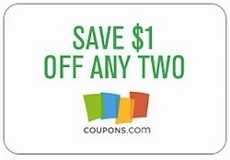 You can scan old photos to your printer, or print directly from digital files on your PC. Keep in mind the grainy quality of older photos will contribute to the nice handmade look of the finished product, and darker images tend to work better- but dark backgrounds may wash out your transfer. 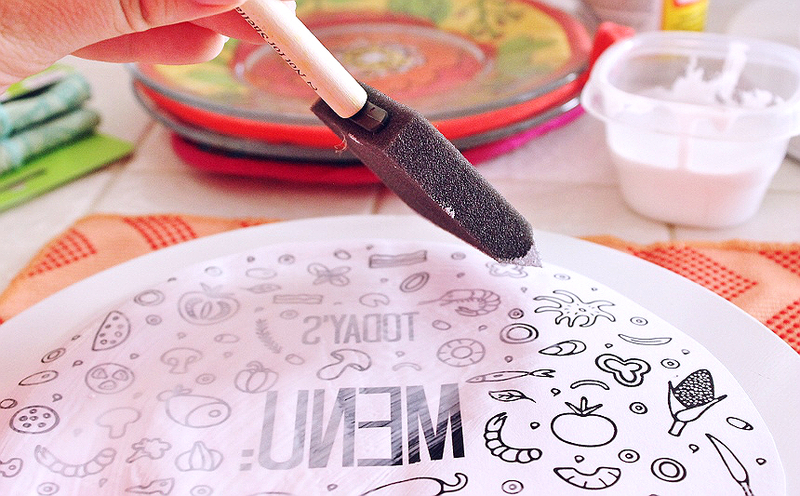 Print directly onto the waxy (shiny) side of your freezer paper. Allow the printed images to dry for 2-3 hours. They will fade, this is normal. Carefully cut out/around your images keeping in mind the ink will smear if touched. 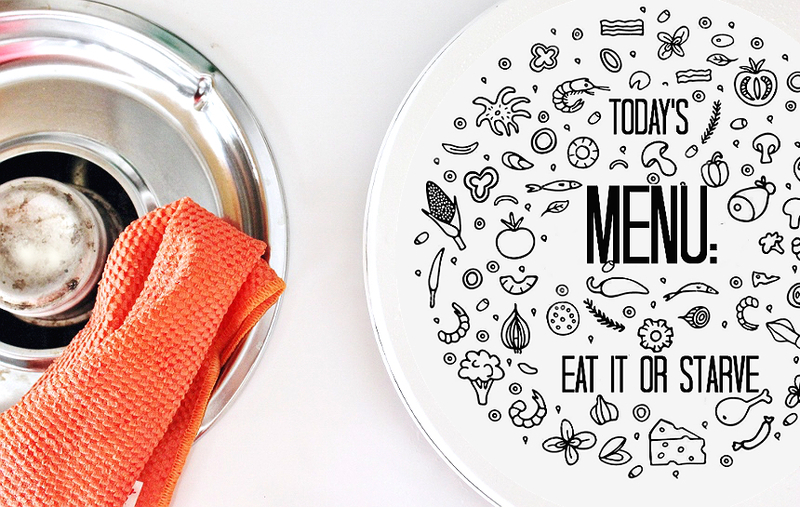 Gently lay your image on top of your plate, printed side down, where you want it positioned. 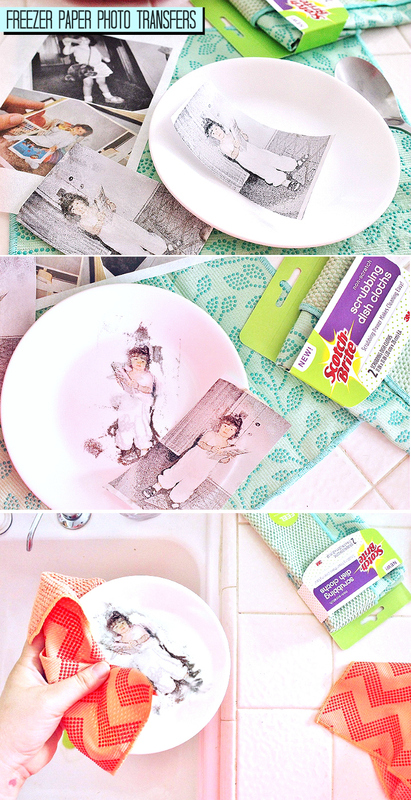 With force hold the image down and in place as you use the back of a wide spoon to rub/transfer the image. Keep in mind any movement may cause the image to distort, or the transfer to move. This technique takes practice and patience but clear and whole transfers can be achieved. If you mess up or feel your transfer wasn't sharp enough simply wash off the ink with some dish soap, dry, and try again. The image will NOT remain permanent unless sealed. ***There are very few 'sealants' that will preserve your image while making the plate safe to touch food. Research your seal/top coat before buying- Shellac is my preferred type of seal as it dries safe enough to seal children's toys and kitchen surfaces for food contact. 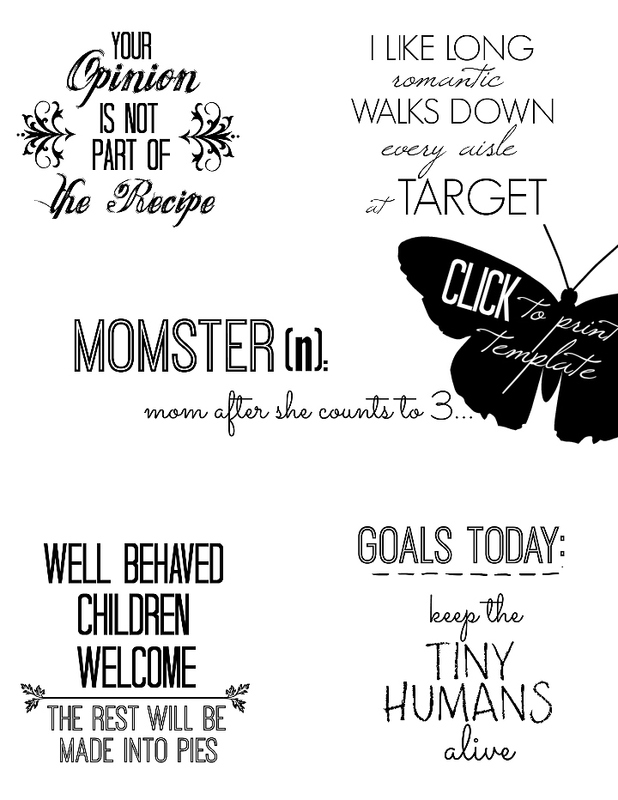 ***Grab our FREE Cupcake template here, our FREE Eat Or Starve template here, and our FREE Fun Phrases template here. Please note the templates are inverted so the words transfer legibly onto your projects. There is a bit of debate as to whether you need to let your ink settle before beginning the transfer process. I allowed my pages to settle overnight THEN realized I hadn't inverted my templates and had to rush to re-print. So, I didn't really allow my pages to dry much more than 15 minutes before beginning- this seemed to work fine. I also want to note that I printed on high quality color- you're going to want to print on high quality black and white- I found that some 'red' tones of color bled during the last steps of this process as a result of my printer 'mixing' the black color, rather than just using black ink. Trim your image as close as you can to allow for minimal work later on. Brush a light layer of your matte waterbase craft sealer directly onto the printed side of your image. You don't have to go 'super thin' but you don't want gobs of the sealer buckling the paper and creating bubbles, either. Carefully lower the printed/sealer side down in position on your surface and gently smooth out any bubbles/ripples. Allow the paper to dry entirely (so as to create complete resistance if you attempt to peel it up). This took about 45 minutes outside in direct sun. Leaving the paper to dry overnight will not harm it, if desired. Next is the magical part- removing the paper to reveal the 'transferred' image beneath! 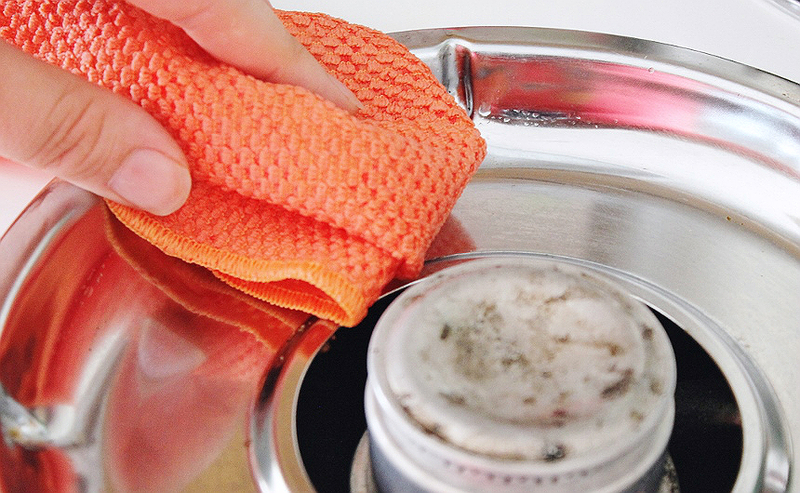 With a clean bowl of water gently dab the corner of your scrubbing cloth in water and begin rubbing away the paper. Make slow circular motions with light pressure. If you feel you are removing too much paper at once, or it is gumming up, flip to the soft side of your cloth and continue. 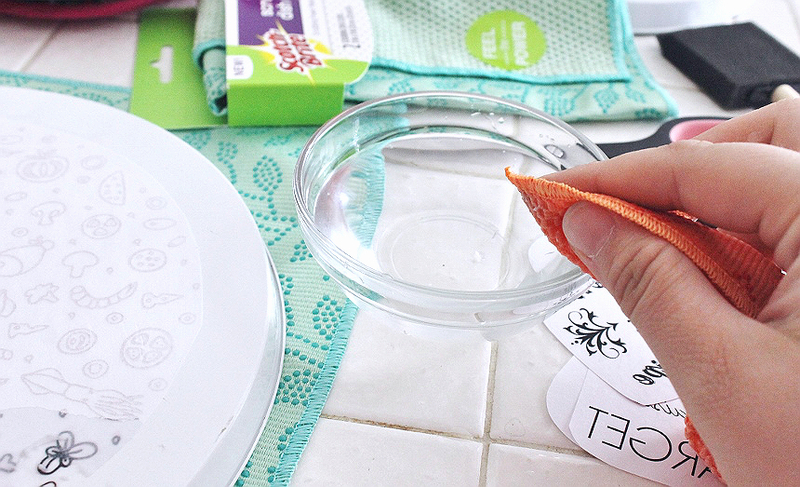 I specifically prefer Scotch-Brite® Scrubbing Dish Cloths for this project thanks to the dual sides and the fact that they will NOT scratch up my surfaces. This process will take 30 minutes or more for projects similar in size to these burner covers. Patience will reveal a nice clean, solid image so take your time and feel free to change sections when you feel you are beginning to overwork. Ideally you will remove all of the paper layer of your transfer, leaving the thin, hard and dry, layer of sealer with the ink trapped inside. Keep in mind the sealer is water-based and WILL rub off of you work your way down through the layers too fast/rough. I really enjoyed this technique of transferring images with printer paper and craft sealer- it's definitely something that looks very sharp and can be perfected over time. Since I liked the minor imperfections in my images (where I got a little overzealous with my rubbing) I decided to seal my burner covers with a food-safe Shellac coat. 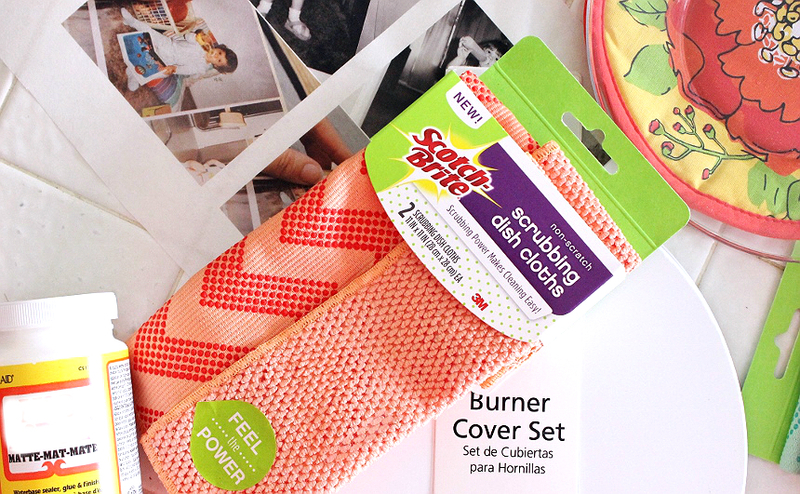 I guess you could say they cover up my 'ugly' burners quite nice- but you and I both know those burners are spotless underneath thanks to my Scotch-Brite® Scrubbing Dish Cloth!. Both the freezer paper and printer paper techniques can be used on a variety of hard surfaces- they're especially great for coffee mugs and handmade gifts. If you still need a little inspiration feel free to grab out funny phrases, inspired by Mother's Day, and play around with the techniques yourself! 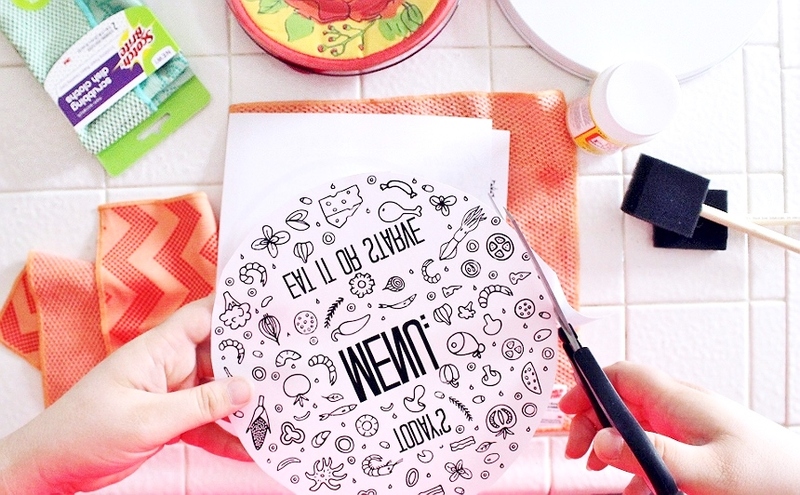 Click HERE to grab the fun FREE printable from above! 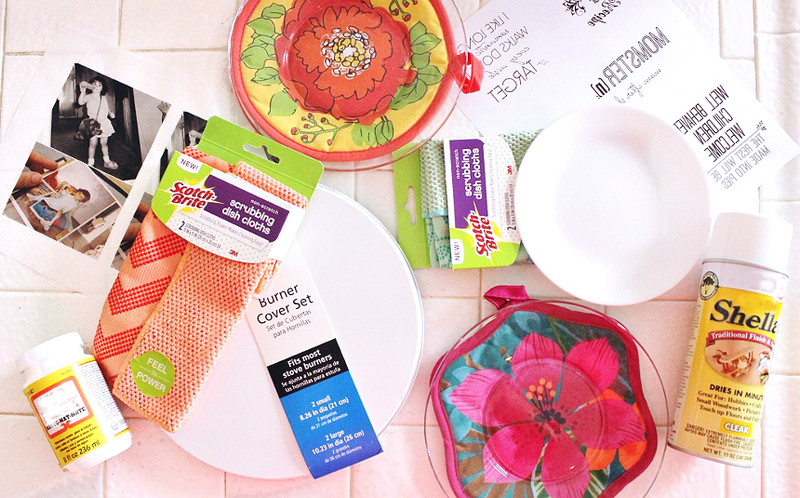 So there you have it- how I'm dressing up, and cleaning up, my kitchen this Spring with a little help from #TeamDishCloth and the Scotch-Brite® Scrubbing Dish Cloth. 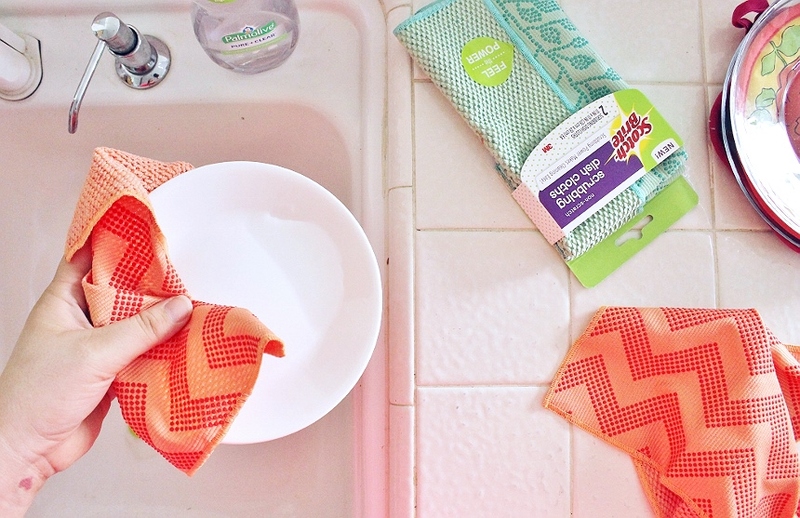 Not convinced scrubbing dish cloths are the side for you? Check out more fun recipes and projects to inspire you to declare a side on this great kitchen debate- visit the Social Hub! 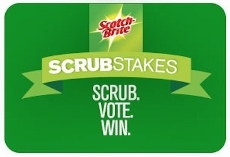 Even more exciting enter the Scotch-Brite Scrubstakes for your chance to win $20,000 towards a kitchen makeover and grab a special printable coupon good for $1 off 2 Scotch-Brite products (While supplies last) and iBotta rebate offer! Now, tell me what you would do with $20k to renovate your kitchen! Those came out really cute. 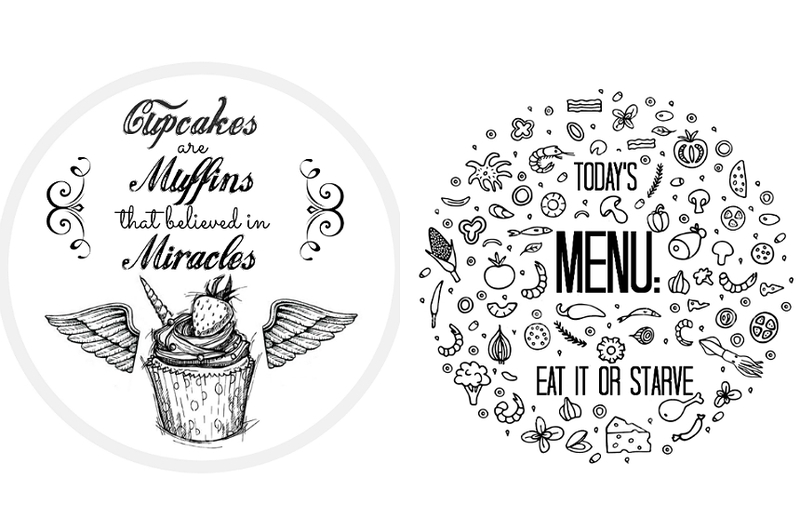 I think I like the cupcake quote the best. I'll have to give this a try. 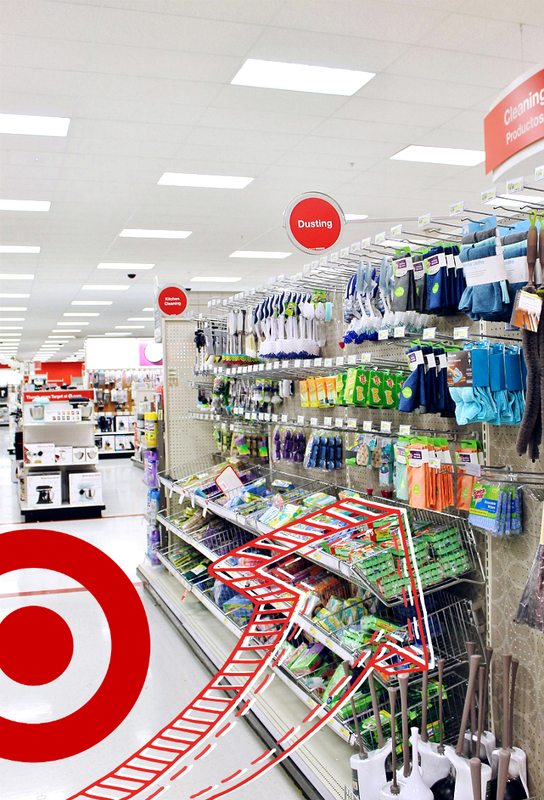 I would start with ripping out my tile floor and putting down something much more functional. If I had money left I would probably try to install soft close drawers. Loved those burner covers, what a genius idea.